Our research is based on the need to understand the genetic mechanisms that control the establishment of the circuitry of the nervous system and for insights into the normal and pathological function of proteins that contribute to neurodegenerative disease. Through a better knowledge of how neural development normally occurs and how neurodegenerative pathologies emerge we hope to provide information to combat neural disease or injury. A correctly functioning nervous system requires that a large number of neurons establish a precise pattern of connectivity. Each neuron extends an axonal projection from its cell body to reach its final innervation target. Vertebrates and invertebrates face this same formidable task of establishing an intricate and highly precise pattern of axon pathways, and it is clear from the molecules identified to date that many are highly conserved between species. However, the numbers of molecules identified thus far are unlikely to be sufficient to encode the complete wiring of the nervous system. 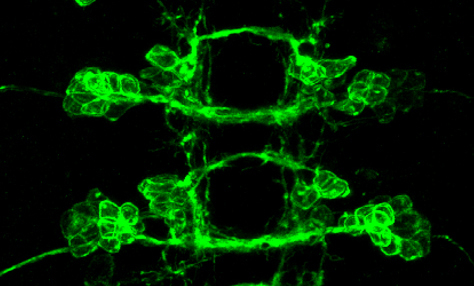 We use Drosophila as a model system to both identify and characterise genes required for axon guidance in the CNS and to identify functions and pathways regulated by genes associated with neurodegenerative disease. A new mechanism for guiding axons across the midline has been documented.